>Does China have the worst English teachers in the world according to international test results? >Some teachers tried to tell me that China has the worst teachers and students based on the international test results of the Cambridge BEC tests. Is that true? Can we use those tests results and other tests like IELTS and TEOFL to see where the best and worst English teaching is being done? Here are the statistics for 2004 sorted from lowest pass rate to best pass rate, or you could say from worse to best. As you can see, China did indeed score the worst of all the other countries. Does this mean China’s teachers are the worst? There is an easy test we can apply to find out the answer. If these statistics show us that China’s teachers are the worst in the world then they should also help us to see which teachers are the best in the world. Is it true that Slovenia has the best teachers in the world? They scored a 95% pass rate! Incredible! Even better than Canadian teachers. How did they do that? And what about British teachers? Is it true that Argentinean teachers are better than British teachers? I’m afraid we can only use the pass/failure rates of the BEC (and also the IELTS) to show us the rates of those who took the test and passed or failed. It does not reflect the language ability of students in general and the teaching ability of teachers in general. People take this test for different reasons, different goals at different ages. Only if the BEC was given to ALL High School graduates or at least a true random sampling of students who were ALL at the same level could we use them to try to interpret teaching quality. These statistics from the BEC do not answer the question on the English teaching ability of teachers in China. But this does not mean Chinese English teachers are good. It only means these particular statistics are not going to be useful in the question. As I said, it doesn’t really matter if China came in last in the BEC tests as this sort of test is not going to tell us anything about the teaching or learning skills. > As far as teaching students who are working, I’m terribly disappointed with the published materials for English for Special Purposes (ESP). Our school wanted to start several various ESP programs and we did a review of all the books available. Cambridge’s Information Technology ESP book, embarrassingly, has vocabulary including for “floppy disk”. It is typical of many books on the market. (1) Out of date information. These books get old and are not updated. (2) Out of touch. IT people nearly always have a good technical vocabulary and perhaps to a lesser extent so do other professionals. Of all the ESPs the biggest one and the one that attracts the most efforts of publishers is Business English. Even with Business English it is difficult to find material that is truly suitable for office workers. Greetings from Susan Lau, MNO Guangzhou. Per PQ’s e-mail below, I believe you already come into production the Holiday POPs. As you know, MNO need to repack and allocate the POPs to more than 400 RST Stores in Mainland China. Therefore, we need your cooperation to deliver the POPs to MNO on or before Dec. 27, 2004. Otherwise, some POPs will be delivered by Express mail, this will bring on high delivery cost. Any query or comments please feel free to call me or send me an E-mail. Most business people have difficulty with basic English. Students should probably focus on basic English until the upper-intermediate level. At that point the technical vocabulary they need is often particular to their specific type of business and their particular company and it is unlikely that a business book will even come close to it. What is the solution? Something the publishers have no interest in giving us. The ultimate ESP teacher tool would be a computer program that drove a flexible template based course generator. It would be strong on basic functions and notions and grammar practice (as is needed in the sample above) and allow teachers to easily insert the vocabulary and themes needed by the ESP teacher. 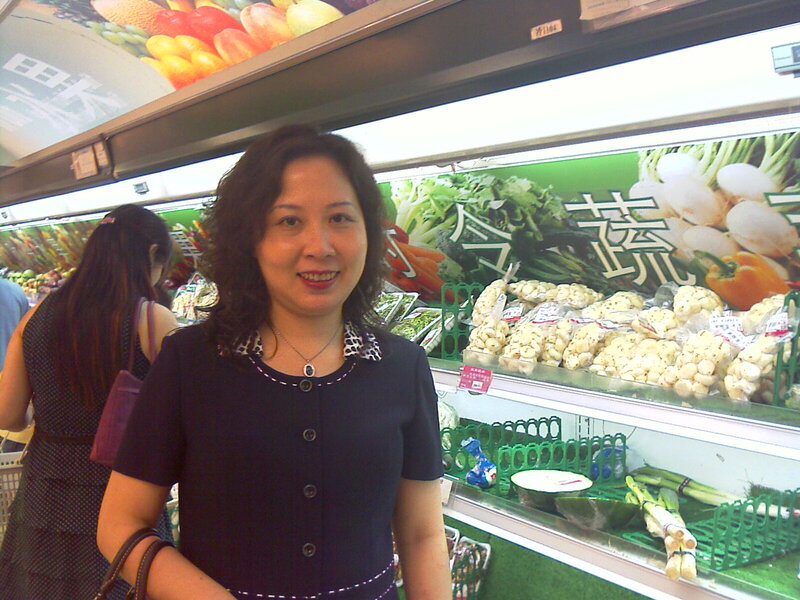 Photo: My student, a manager of a cold storage logistics company, visiting one of the top supermarkets in the city with me, learning and practicing her English about…well, cold storage. >A teacher wants to know what students can do to help themselves improve their English outside of class. One of the hardest things to do with students who do not live in an English speaking country is to help them practice their spoken English. Thanks to today’s modern technology, this no longer has to be a problem. Skype is a free “telephone” program with which you can call another person computer to computer. The sound is of such a high quality it rivals a telephone call. Skype is currently the most popular downloaded program in the world. It’s completely free. Students can call each other or people all over the world to practice their English. There are some businesses which use Skype (search Skype for “hotel” or “services”) which may be more ready to speak, especially to people perceived as potential customers. Teachers can also have conference calls with students. Additionally, for about 2 cents a minute Skype users can call normal telephones. This opens up just about every phone in the world. They could spend hours and just a few dollars practicing their English by getting information on ski trips and lodgings, cost of notebook computers and their features, and how the services of a personality consultant can makeover their life. Rest assured, Grammar will never be without a job. Up until the 1970’s, Grammar used to be the mega movie star of English teaching, a true prima donna. Grammar was simply adored by all fans; teachers and students, alike. Grammar’s name featured prominently on every textbook or coursebook. People memorized every aspect of Grammar. It was near worship. Then Chomsky released his blockbuster which, while not widely accepted by the entire public, marked a new era and saw Grammar’s popularity begin to wane. Grammar suffered further humiliation when Krashen came along. Now many people respect Grammar just as many people regard Casablanca or Gone With The Wind, one of the greatest movies ever made. But when most people want real entertainment, they don’t go to these old movies any more. In my reviews of these studies, I have concluded that they confirm the correctness of the Comprehension and Monitor Hypotheses: they show only that even after substantial grammar study, even very motivated students show only modest gains in accuracy, and these gains occur only on measures that encourage a focus on form. Truscott (1998) has arrived at very similar conclusions. Some have interpreted this position as a claim that all grammar teaching is forbidden. Not so. There are two good reasons for including grammar in the EFL curriculum. The first is for “language appreciation,” otherwise known as “linguistics.” Linguistics includes language universals, language change, dialects, etc. The second is to fill gaps left by incomplete acquisition and places in which idiolects differ from the prestige dialect. Society’s standards for accuracy, especially in writing, are 100%: We are not allowed “mistakes” in punctuation, spelling or grammar. One public error, in fact, can result in humiliation. Even well-read native speakers have gaps, places where their grammatical competence differs from accepted use. Consciously learned rules can fill some of these gaps, which are typically in aspects of language that do not affect communication of messages. The place to use this knowledge is in the editing stage of the composing process, when appealing to conscious rules will not interfere with communication. I recommend delaying the teaching of these rules until more advanced levels. I would first give acquisition a chance, and then use conscious knowledge to fill in some of the gaps. There is no sense teaching rules for Monitoring that will eventually be acquired. Grammar, thus, is not excluded. It is, however, no longer the star player but has only a supporting role. The big problem with teachers referring to their own learning experiences is that often teachers are good students. Of course, that wouldn’t be a problem if our students were good students. Some of us were good students in school. Perhaps we even sat in the front of the class, got good grades, really enjoyed learning, perhaps found it somewhat easier than our classmates. Many of these kinds of students become teachers. But that actually skews our viewpoints of the learning process and what works and what doesn’t work in the classroom. A friend and I decided to learn Japanese. We got a book. There were no tapes. I quit after two weeks. Today, my friend has a pretty good command of Japanese. He LOVES grammar, says it’s like a puzzle to him. When he was in school he used to do algebra exercises for relaxation. The kinds of students we have to worry about are the ones who are not doing so well in the class. The “average” learner, not naturally academically inclined nor super motivated. The kid sitting in the back of the class, or at least in the middle. So when we as teachers use ourselves as examples we have to ask ourselves are we the right kind of example to give us insight into our students needs? >Although I love movies I seldom use them in the classroom. The biggest problems are that the language is normal or even above normal (flavored with special accents that I have seldom come in contact with in my 20+ years around the world, or peppered with the vocabulary of special interest groups of people like maybe hip-hop). I have few real advanced students who could understand 80-90% of this, most of mine are upper or lower-intermediates. I buy into Krashen’s input hypothesis which holds that the learner improves and progresses along the ‘natural order’ when he/she receives second language ‘input’ that is one step beyond his/her current stage of linguistic competence. For example, if a learner is at a stage ‘i’, then acquisition takes place when he/she is exposed to ‘Comprehensible Input’ that belongs to level ‘i + 1’. The second problem is time. Movies run to 90-120 minutes. If pauses are added that brings it to 120-150 minutes which in my situation is too long. When I do show a movie I will preview the movie 2-3 times jotting down an outline of the movie, transcribing a few bits and also selecting certain sections to skip to cut the movie shorter. Of course, I also try to find the script on the Internet but seldom have success for the movies I have shown. But I do try to create some sort of hand out for the students to emphasize points I want to teach. The bottom line has been that that they can take enormous amounts of time trying to prepare, show and teach from a movie. Later I will discuss some great ways you can use movies. >I had an interesting discussion with some teachers in Japan about why Japanese students are so quiet in class. But it seems odd to discuss the quietness of Japanese students with you, the reader of this blog, yes, YOU. Why are Japanese so shy? Why do they respond so little? What is it in their culture that causes this situation? What can teachers do to make Asian students more responsive? After all, as teachers we think our students should be responsive. They should be interactive. Right? What teacher in his right mind would actually want students who are not interactive? Who would want quiet non-responsive students? Although you and I are not students it does seem really odd that we even try to discuss this question on this blog. Why does it seem odd?…because you are probably not going to comment on this blog. You will not mention your thoughts or opinion, agreement or disagreement. YOU are going to be quiet. YOU are not going to interact. I am not upset with YOU. It’s just that I don’t understand how we can ask our students to be something that we are not going to make the effort to be ourselves, interactive. Is it because the YOU are too timid to venture an opinion? Some people reading this page are experienced teachers, MA’s or even PhD’s. It is likely we may draw some managers of various schools as well as IELTS, UCLES, TOEFL, ETS, Oxford and Cambridge University Press. We may have university professors who visit. We may have the very gurus and rock stars of our profession on this list. But still this blog is impoverished by the lack of sharing of the riches of their experience and training. Seriously, how can we as professionals in this field ever blame the poor students in Japan for not being interactive when we are doing the very same thing everyday? Please tell us in the “Comments” section. This teacher and others have given some very good and practical advice. Even Edward De Bono, the father of the approach to Lateral Thinking, had trouble with this and offered no revolutionary solutions except for calling on students directly. But I suppose I often break all the rules of sensitivity, politeness and courtesy. Is there something wrong with Chinese culture? No. It’s different. But if my students are going to be talking to the world, if they want to be able to be effective with all manners of people, they need to realize what Westerners think and expect just as much as we need to sensitize ourselves to the different ways of Asians. I then demand that they speak up and not do the group thing to me. >Should students practice their English by posting articles to Wikipedia? I’m sure students get a great thrill out of contributing to something that is as famous and internationally recognized as the English version of Wikipedia. But I can’t help but feel it is irresponsible for a teacher to have a number of students do such a thing and violates the expectations of the people who go to Wikipedia for facts. If one student does it, it probably won’t hurt anything. By definition, English students are learning English because their English is not “good enough”. They feel their ability to communicate in English is too poor. That’s why they study English. Why is their English suddenly of the caliber to contribute to an encyclopedia? And why “their own ideas”? Wikipedia is not a blog. Just because they CAN do it does not mean they SHOULD do it. It would be better for them to write to some more informal areas of the web like actual blogs. Likewise, a mailing list like TESL-L does not allow linguistics teachers to assign students to post here as a class project or homework. Without this rule, list members would become defacto teacher’s assistants to a group of students in Morocco or some such place. Of course, Wikipedia has different language versions and the students may do an excellent job contributing to one in their own L1. There are good places for students to practice and there are bad places for students to practice. Wikipedia was not designed as a practice venue for English students.